becca's birthday is Sunday. We're planning on doing something involving a whiffle ball and a go kart since we don't really have the money to shop. But I have fist fulls of imaginary dollars! becca loves purple, dresses, and ruffles. She also looks killer in a pencil skirt. Look! All four in one dress. 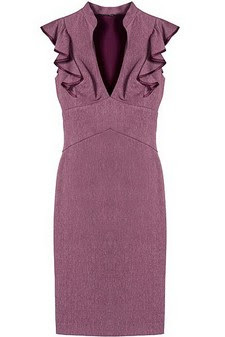 This curve-loving dress by Black Halo is deliciously retro and could easily go from an office to a party. It's $345 at Chick Downtown. becca's also a sucker for an unique print, so I think she'd love this sea print sheath from Versace ($1,955 at Neiman Marcus). Her grandmother's jewelry gave becca a deep love of big statement necklaces, something she's embraced fully since college. 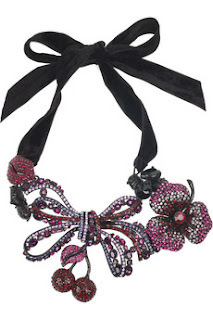 In this dream world, I could get her this crystal burgundy necklace by Sonia Rykiel ($1950 at Net-a-Porter). Appealing to becca's Betsey Johnson love is a more realistic option, and I'm sure she could find many ways to wear this pearl cluster chain ($125 at Nordstrom). 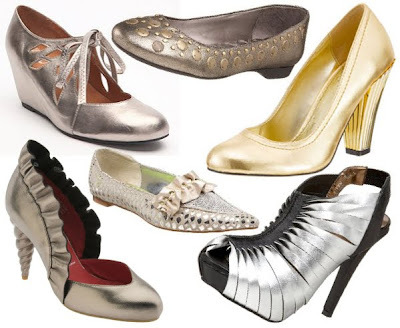 We could spend all day just shopping for shoes. Sometimes those days are triumphant, but others end in frustration and chocolate. 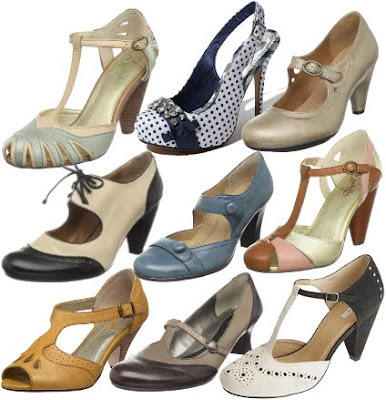 Today, becca, all the shoes fit. Since I'm making promises and exhausting my reserves of fake cash, I'll also tell you that you can walk in all these shoes for miles and feel like you're in house slippers. 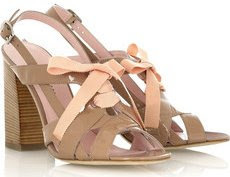 Marc by Marc's patent ribbon sandals ($350 on Net-a-Porter) are just the thing for an every day summer shoe. 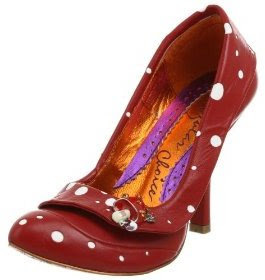 For your quirky days, pull out these dotted "Magic Mushroom" pumps by Iregular Choice ($83.15 on Endless). (Unfortunately, the princess is in another castle.) 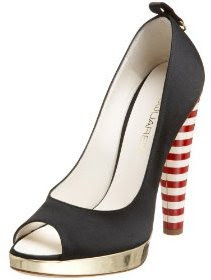 These striped heel shoes by DSquared are called "Barber Shop" ($664.95 on Endless). You love them even more knowing that, don't you? Now let's gorge ourselves on decadent chocolate cake and still fit in our jeans. I'm in love with all of these things! Ogling them has been a very fun b-day present!